Last Saturday's shopping took me to my Mall's Chico's store. The items above that I purchased are both casual and dressy. A great Florida summer, out to dinner, look. I also have a navy sleeveless sweater that works together with the pants. I usually avoid light colors on the top and find darker colors to be more flattering but this seems work. Together it is almost a monochrome, solid look. I love the way these fabrics drape in a very feminine way - I am becoming very aware of the "The Feminine Differential". I am thinking sandals or low heels white/grey sling back pumps. I hope to post photos soon. Almost all malls across the country have Chico's, White House Black Market and Soma apperal stores. 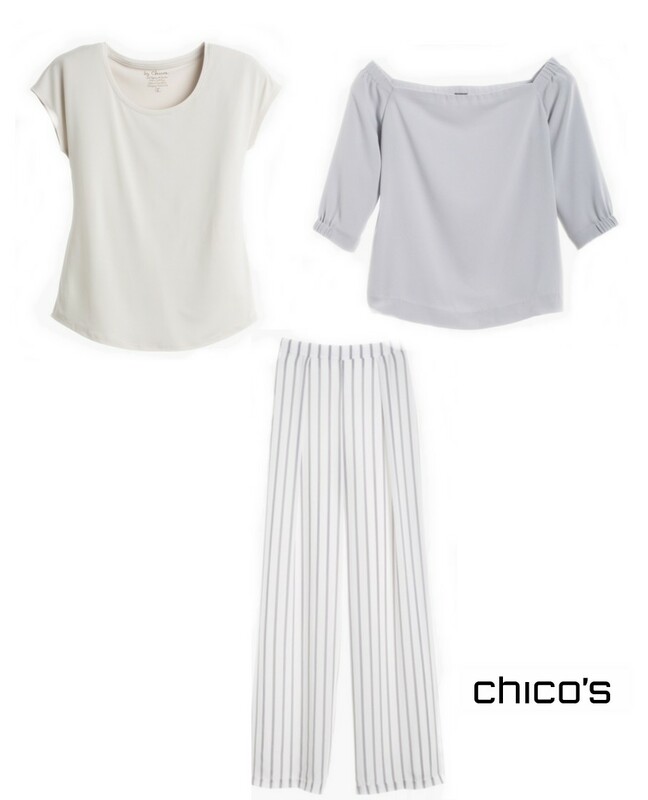 Chico's is the holding company and describes itself as a leading omni-channel specialty retailer of women's private branded, sophisticated, casual-to-dressy clothing, intimates, complementary accessories, and other non-clothing items. That works for me and I am starting to like Chico's more in spite of their weird sizing. If you are not aware of the way the size by category fits, know that trying on items is a must, before purchasing. Sometimes I am a zero; sometimes a one. Typically a generous fit. Go figure - pun intended. One of my favorite on-line/catalog retailers is "Boston Proper" which was at one time part of the Chico's empire. It has been recently sold and the brand will continue as an on-line/catalog seller. It is always a fun catalog to study but I seldom purchased because of its targeted youth market look.